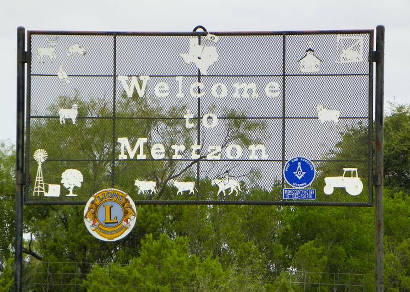 Mertzon, Texas, Irion County seat. 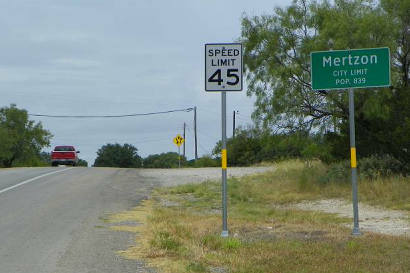 The town was named after M. L. Mertz who was a director of the Kansas City, Mexico and Orient Railway. 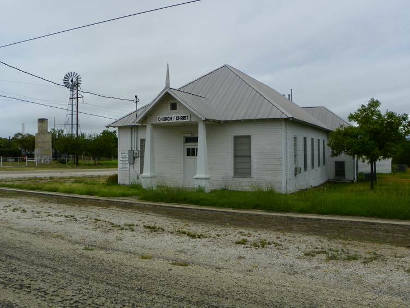 A post office was opened in 1908 and the railroad entered Irion County in 1911 bypassing the Sherwood by a mere 1.5 miles. 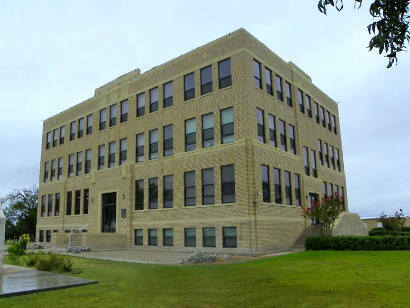 The town incorporated in 1933 and an election was held in 1936 to determine which town would be the county seat. Sherwood lost. 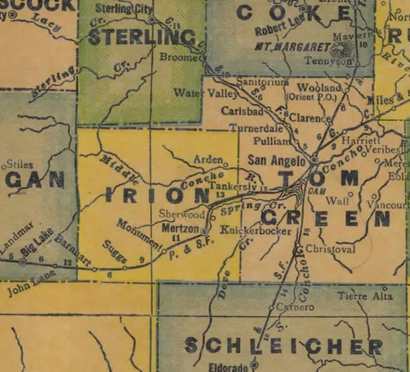 The combined population of all towns in Irion County does not exceed 2,000 persons. Last time I drove through Mertzon, it sunk in on me that the windmills were gone. West Texas still has plenty of Aermotors cranking away, and on many mesa tops giant wind turbines are popping up like rain lillies, but Mertzon used to depend on wind power long before it was the green thing to do. �They look like a field of iron sunflowers in the distance, but they�re windmills � literally scores of them scattered all over Mertzon. �Though no one has tried to organize the movement, there is a distinct possibility that without much effort, Mertzon could be named the Windmill Capital of the World. 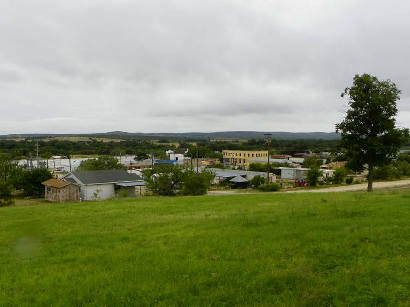 �One Mertzon resident estimated there were about 100 windmills dotting the small Irion County capital and at one time, even more. �The reason for all the windmills is that Mertzon has no public water works. If a resident wants running water, either a windmill or an electric pump must be used. �Mertzon residents naturally don�t pay much attention to their abundant windmills, but motorists passing through on U.S. 67 often are surprised. �If Mertzon does own the title of windmill Vatican City, it�s going to have to enjoy it while it can. The day will come when the electric pump phases out the windmill for good, at least inside the citiy limits. �Today (1968), people are finding electric pumps quite a bit less expensive than the traditional windmill. A good windmill costs about $700 while an electric pump can be installed for around $300, the judge said. �But no one around Mertzon intends to junk their windmill before it doesn�t work any more, and even then they sometimes leave them standing. �If a city water plant was constructed, however, the pumps and windmills would be made useless. But the chance for a city owned water plant any time soon is not very likely. �There is commercially-owned water system in the city, but it does not serve the whole city. �One resident said for each windmill in Mertzon there is a different tasting water supply. ��Some of it is really good, but some wells are so bad you can hardly drink the stuff,�� he said. These days, alas, the urban windmill thicket is gone and folks in Mertzon no longer enjoy free water.